I was happily lolly-gagging through life when the time came to make that all important decision about post-secondary school. By this time, I had worked a wide variety of part-time jobs, from grocery store cashier to mowing lawns to picking cukes. Oh, how I hated being stuck in a sauna-like greenhouse all summer with those scratchy cucumber plants leaving the skin on my arms in tatters. The one job that I thoroughly enjoyed, however, was at a dog kennel. I loved being around the dogs all day, feeding, walking, bathing, picking up poop. OK, I didn't enjoy that last one, but it came with the territory. I grew up with my own dogs, so I felt right at home. It was a no-brainer for me to pursue being a certified dog trainer after high school. A month after graduation I moved to Niagara Falls and began a one year apprenticeship under dog training guru Dave McMahon, of McMahon's Dog Training Academy. Let me tell you, it was a grueling year. Training was mostly in the evenings, so I jumped at the chance to be able to pay for my apprenticeship during the day. From sun-up to late afternoon I worked at Tim Horton's (I mean, who in Canada hasn't spent at least a little time working there?! ), then I'd race home to change and pick up my dog, Justice, and head out to the training academy until 9:30 p.m. Go home, sleep. And repeat. But I was in my glory! I loved every minute that I spent learning and training. Something I never thought possible. Ever. Seriously, it didn't enter my wildest dreams. 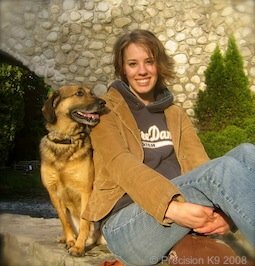 Precision K9 Professional Training opened its doors in 2008, starting small but quickly exploding into three full evenings of dog training for me! I loved my job, and seeing how I could help owners transform their unmanageable dogs into pictures of obedience just fueled my desire to help more. While I'm at it, I had better introduce you to my dog as well, who is mentioned often on here. Meet Justice! This gorgeous girl was rescued off the street as a puppy where she was found with her litter mates. 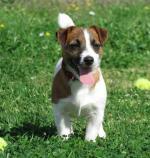 Training her was a small challenge, but she is now 8 years old and a happy, obedient and well-adjusted family pet. There is no real pedigree to her, either... as far as we can tell, she is part German Shepherd, part Lab and part Beagle! I also went back to college at this time to get my diploma in medical administration, and started working part time at a hospital. For me, though, family is more important than any career I could have. And it was starting to put a serious dent into time spent with my hubby. Something had to change. I didn't want to be the wife or mom that was always gone in the evenings and on weekends for work. I wanted to be able to stay home with our kids one day, without having to worry about money all the time. I wanted the freedom (and finances) to have choices for our life! Not wanting to give up my love for dog training, I stumbled upon SBI - which stands for Site Build It! and helps anyone turn a hobby or skill into a viable online business. I have to admit, I was a little unsure... me? Build a website?? I mean, yes, I know how to get around online, but this seemed so... "out of my scope of practice" as we say in the medical field. Well, this website is a testament to the fact that anyone can do it! I can attest to the fact that you don't need any programming or web design skills, and you don't even need a business or have a product to sell. SBI has all the tools you need, and even better, they guide and teach you step by step, the whole way! You don't even need to know what you want to have a site about... they help you choose the best topic, build your own site, get it ranking at the search engines, and (here's the big one!) even make money at it. My site, Precision K9, isn't nearly as good as it gets... I'm still working on it! But if you want to see some other sites that are built by other "normal" people like us, and in the top 1% of web success - here it is, tons of SBI success stories. The best part is that it's totally risk-free. SBI sticks to a 100% money-back refund if you don't like it. For me, this was really important before I decided to try it, and I'm so glad I did! I rarely hear people talking about how much they love what they do... and it's sad! We're all the same, we all want to escape the rat race, leave the commute behind, stay at home with the kids, travel more... close your eyes and think about what you really want to do. Precision K9 might not be a local dog training school anymore, but I have the ability to go world-wide now. This is really exciting for me! First and foremost, I am passionate about showing other dog owners how to work towards a balanced dog. This means that this site is for you. As Margaret Fuller said, "If you have knowledge, let others light their candles at it". 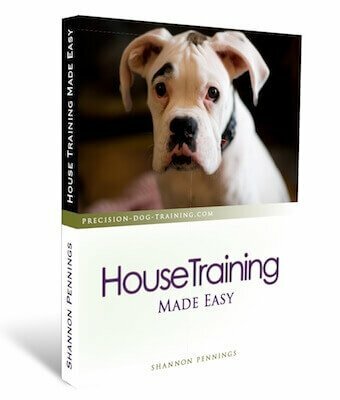 In the future, I hope to add several of my own e-books to the site, as well as downloadable dog training movies that will cover all ten lessons of a Novice Level training course (the basics). Other than that, it really is a work in progress.